Its been so dull and glum today, I didnt really want to get out of my jimjams! However I was dragged out of my cave and went shopping with my Mum today instead of our usual Sunday jaunt as we have a family meal tomorrow. Just threw on a tunic and some jeggings/treggings/leggings and my trusty H&M single breasted coat. Its one of my favourite items I have in my wardrobe and I wear it most days. I cant believe it was one of those items that almost got away! Love, Hearts and Crosses sent me some of their items and including this faux Arty ring, which I absolutely adore. The thing that really put me off getting a real Arty is that I don't wear gold jewellery, I much prefer silver. I think gold can look really tacky at times. However I do think they did make a "real" version of the black and silver, but this will do for me! it's unfair how much hats suit you! How gorgeous is that ring.. will have to have a look at their site! I love the coat! I bought those earrings earlier today, really impressed with primarks jewellery at the moment! Such a darling outfit for being on the whim! And the ring is a great representation. I share the same feeling about gold jewelry- you look fantastic in silver! i love the outfit, anything leopard print catches my eye! love this outfit! the blazer fits perfectly! Absolutely love this! The great thing about your style is that you make everything look expensive, when really they are very accessible to the general public! 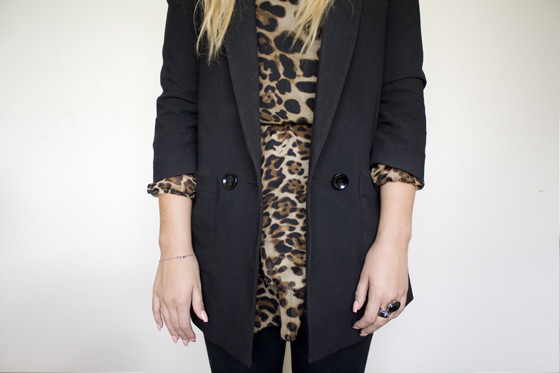 Your leopard print tunic looks really sophisticated :) specially with that gorgeous blazer! I'm currently on the hunt for the perfect high-street blazer, but knowing my luck, you probably bought it ages ago! Anyway, your blog is really great to read, thank you for sharing! Lily you look amazing!!! Your skin looks gorgeous :) I love this outfit, especially the tunic and blazer/coat!! You look amazing as usual. I'm really loving the leopard look. It's not too much, but makes such a statement. I got a faux arty ring in blue from Dolly Bow Bow. I prefer Gold to Silver. The tunic looks great girly! Loving the leopard print, no one does it quite as well as you! Love hearts and crosses has some lovely stuff on there! I also prefer silver, always have done, not sure why really. We've not seen that hat in a while ! You look gorgeous! Ahh I've been in search for a similar blazer in H&M here in the US but no luck! They always never have my size! And how's the quality of the dress from the wholesale? I've been meaning to get something from there but it looks a bit sketchy! 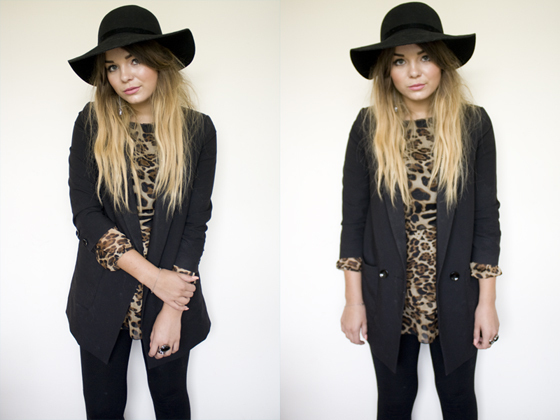 Great outfit - can't beat leopard print! I love this blazer - h&m a/w looks really great - holding onto my catalogue in preparation for a big order! love the idea of styling a black hat with outfits! especially come fall and winter time! Great outfit! Love the leopard print. This outfit is lovely Lily :) I really adore that ring, I never would have guessed that it's not a real YSL one. I love the leopard print too. Really love this look! The leopard print is the perfect contrast against all of the black. I also adore your nails, such a beautiful color! got to love a bit of animal print!! Love the leopard print! And have just bought the faux arty ring from the same store *plays scary music* I'm impatiently waiting for it to arrive! Ooohhh I finally found the 'post a comment' button! It's teeny weeny!! I know thats a terrible excuse for not commenting before but I honestly have never been able to find it! I love your hat and jewellery ! I adore your ring, coat and everything. you're so pretty! Glad to find another Alexisonfire fan on here! currently listening to City and Colour :) loved them for years. i have that hat, looove it! Bagaimana Cara Mengobati Bintil Kutil Di Kemaluan Pria?